1. What are the health effects of air pollution? 2. Why do foothill communities like Auburn and Grass Valley show high levels of ozone air pollution even though they're located away from major metropolitan areas? 3. What do Ozone Maps really show? 4. What is the main cause of ozone air pollution (smog) in the Sacramento region? 5. Is it safe to do exercise outdoors on a Spare The Air day? 6. What can I do to help on Spare The Air days? 7. If ozone is invisible, why is there poor visibility on Spare The Air days? 8. Why doesn't the air quality map include Chico? How are the boundaries of the map defined? 9. Where are the air monitoring sites located? 10. Is there an Air Alert email service for the Bay Area? 11. How are air quality maps produced? Even healthy people can experience impacts from polluted air including respiratory irritation or breathing difficulties during exercise or outdoor activities. Your actual risk of adverse effects depends on your current health status, the pollutant type and concentration, and the length of your exposure to the polluted air. While the majority of ozone-forming emissions are produced by cars and other sources in the Sacramento Metropolitan area, prevailing winds usually carry pollution up into the foothills. During this transport time, the emitted pollutants --- volatile organic compounds (VOCs) and oxides of nitrogen (NOx) -- continuously react with each other and the sun's ultraviolet rays to form ground-level ozone. By the time this polluted air reaches the foothills, the majority of the emissions have been converted to ozone causing the foothills to frequently have the highest ozone levels in the region. When the wind is calm, the emissions and ozone are not transported to the foothills, but remain closer to Sacramento. However, when the wind blows from the north to the south, the highest ozone concentrations actually occur south of Sacramento in areas like Sloughhouse or Jackson. Ozone maps found on SpareTheAir.com use real-time air monitoring data to show ozone air pollution levels throughout the region. Most of the time you'll notice ozone forming in the urban area and then moving "out of town" by the afternoon. However, on some occasions it appears that the ozone is being transported from one area to another area when it is actually forming at different rates in the two areas. For example, in the morning it often appears that moderate levels of ozone are moving from the foothills down into the valley. In reality, ozone levels remain higher in the foothills overnight and through the following morning due to a lack of ozone consumption. Therefore, ozone reaches the moderate level earlier in the day. To understand what is really being shown in the ozone maps you must take into account differences in ozone formation rates in different areas as well as transport by varying wind speeds and directions at all times of the day. Vehicles and other mobile sources, including trucks, locomotives, buses, motorcycles, agricultural equipment and construction equipment, contribute more than 70 percent of the oxides of nitrogen (NOx) and volatile organic compounds (VOCs) that form ground-level ozone air pollution. It is safe to exercise in the morning. Ozone levels climb throughout the day resulting in higher readings in the afternoon and early evening hours. Morning is a good time for biking, walking, jogging or other types of strenuous outdoor activities. 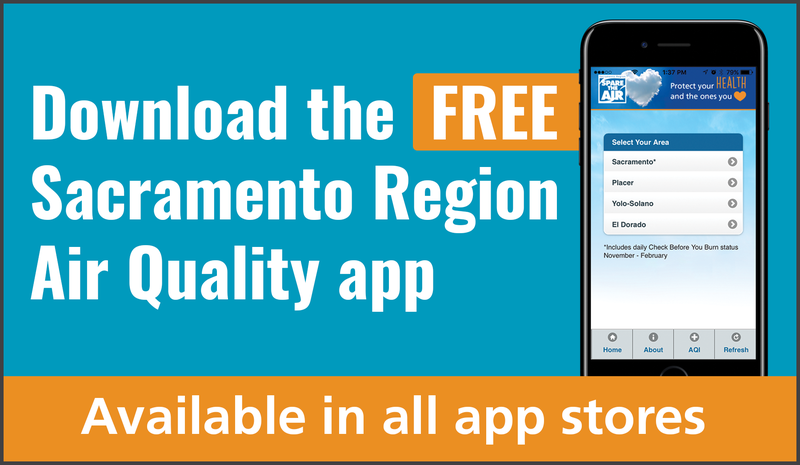 We recommend checking current air quality conditions here on SpareTheAir.com or using the Sacramento Region Air Quality app before participating in any outdoor exercise during the summer. The best way to reduce ozone pollution is to drive less. Mobile sources are the largest contributor to ozone in the Sacramento region. Reducing emissions when Spare The Air is in effect can prevent unhealthy levels of ozone pollution. Carpooling, riding transit, telecommuting, trip-linking, bicycling and walking are all excellent ways to reduce your driving. The reddish-brown haze you often see hanging over the valley is caused by higher concentrations of oxides of nitrogen, better known as NOx. NOx is converted into ozone air pollution when it reacts with volatile organic compounds (VOCs) and "cooks" in the direct ultraviolet rays from the sun. Fine particles, consisting mainly of by-products from internal combustion engines like automobiles, construction and agricultural equipment, contribute to reduced visibility. The air districts of the Sacramento region are committed to developing programs to reduce NOx and fine particle pollution, which will decrease ozone concentrations and improve visibility. The area served by the air quality map primarily includes the federal Sacramento Ozone Nonattainment Area identified by the U.S. Environmental Protection Agency as having a severe ground-level ozone air pollution problem. This area includes all of Sacramento and Yolo counties and portions of El Dorado, Placer, Sutter and Solano counties. Chico is not located within the Nonattainment Area boundaries, and therefore, is not depicted on this website’s map. However, ozone data from Chico are used to define the northern boundary of the air quality map, so it will be helpful to those living north of the Sacramento region. In addition, the map does extend south into northern San Joaquin County to include areas served by Sacramento TV stations, which may broadcast air quality maps during news and weather reports. To view nationwide maps, please visit www.epa.gov/airnow. Here's a list of the air monitors used to produce the air quality maps on SpareTheAir.com. The monitors located in the Sacramento Ozone Nonattainment Area are marked with an asterisk. 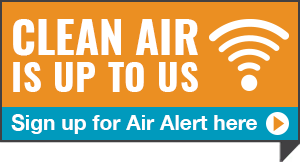 The Bay Area Air Quality Management District provides email notification of air pollution episodes in its jurisdiction. You can sign up at www.baaqmd.gov.